Issued as the ninth coin in the series by the United States Mint, the 2009-W $10 Anna Harrison First Spouse Gold Uncirculated Coin was released on March 5, 2009. Each .9999 fine gold coin in the series is struck to honor a spouse of a former President of the United States, in this case the wife of President William Henry Harrison. A proof version of this coin was also struck by the US Mint. Each spouse coin is released on a schedule tied to the release of the circulating Presidential $1 coins. That schedule honors four Presidents a year, but the authorizing legislation made provisions for those Presidents who had more than one spouse during their tenure. In that case, both spouses will be honored on separate coins as shown with the above Letitia and Julia Tyler coins. If the President was not married while in office, an image of the mythical figure of Liberty will be used instead. A face value of $10 is backed by the United States Government, but the intrinsic value of the half ounce of .9999 fine gold in each coin is worth much more. 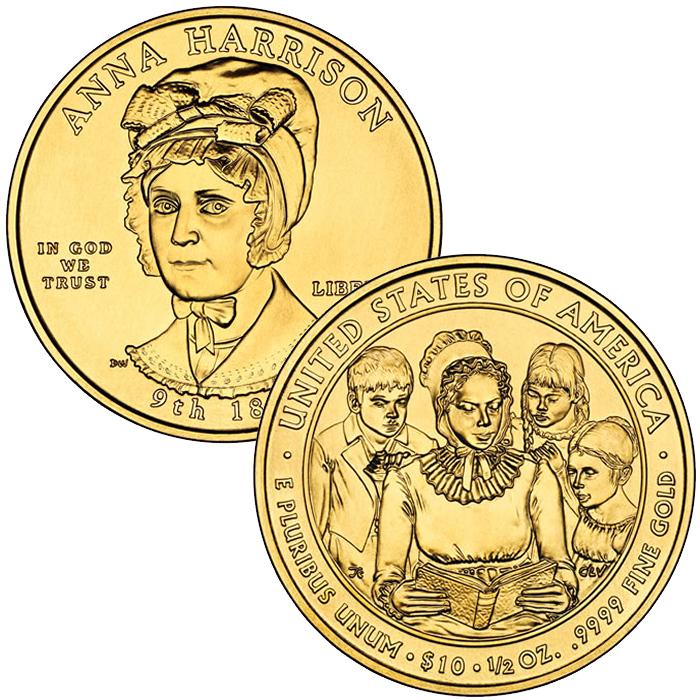 The US Mint released the Anna Harrison coins on March 5, 2009. 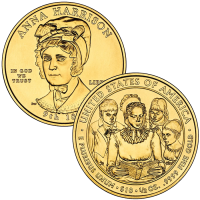 When first released, the US Mint charged $614 for the Anna Harrison First Spouse Gold Uncirculated Coin. The price fluctuated after that point as the Mint Adjusted the price based on its precious metal coins pricing matrix. The portrait of Anna Harrison found on the obverse (heads side) of her coin was designed by Donna Weaver and sculpted by Joseph Menna. The reverse (tails side) of the Harrison strike was designed by Thomas Cleveland and sculpted by Charles Vickers to show Mrs. Harrison reading a book to her students.